Meet the 2017-2018 NUC Executive Committee – UNITY, Inc. The following individuals were elected during the 2017 National UNITY Conference in Denver, CO to serve on the 2017-2018 National UNITY Council Executive Committee. Female Co-President | Sophie Tiger, 19, is an enrolled member of the Comanche Nation of Oklahoma and also from the Standing Rock Sioux Tribe. She has used her experience in her leadership roles to devote her time to contribute to the change within her own community. Sophie played an instrumental role in the development of a drug free youth empowerment initiative that is still supported by the Native community in Comanche Country. During her time at the White House Tribal Leaders Conference as a Youth Ambassador, she had the opportunity to help bring awareness of this initiative to the national level. During President Barack Obama’s address to the Tribal Leaders, he stated that the White House Tribal Youth Ambassadors would also be considered the inaugural class of Youth Ambassadors for Generation Indigenous (Gen-I). Ms. Tiger continued her work with the White House by serving as a member of the steering committee for the first ever White House Tribal Youth Gathering. Last year Sophie was elected as the Southern Plains Representative on the National UNITY Conference Executive Committee for the year of 2015-2016 and 2016-2017. With the collaboration of her fellow Executive Committee, Sophie played a fundamental role in the development of the campaign “Our Sister’s Voice”, which addresses issues involved with violence against our Indigenous women in a proactive and positive manner. As a 2015 Gates Millennium Scholar, she is now a junior at University of Oklahoma in hopes of obtaining a double major in Economics and Political Science with a minor in Native American studies. Sophie’s hard work and determination has allowed her to be listed on the Dean’s List for academic achievement. Sophie wants to gain knowledge to allocate to all Native communities such as programs that empower Native Youth to become future leaders and resources that ensure educational success. Sophie always looks forward to networking with youth from across the country in hopes of making a change within Indian Country. Male Co-President | Hamilton Seymour, 18 years old, a member of the Nooksack Indian Tribe & Stz’ umimus First Nation. Hamilton has served previously on the 2016-2017 National UNITY Council Executive Committee as the Male Co-President and is currently attending Northwest Indian College as he just finished high school. Hamilton is working towards getting his Direct Transfer Degree & will transfer to a University that is yet to be determined. Hamilton’s culture and Organizations like U.N.I.T.Y. 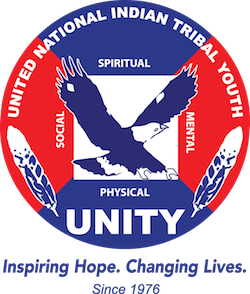 (United National Indian Tribal Youth) C.N.A.Y. (Center for Native American Youth) is what helped Hamilton burst out of his shell and help further and extend his comfort zone. Hamilton is excited to make an impact for Indian Country as this is his last year serving on the National U.N.I.T.Y. Council Executive Committee. Stay tuned. Great Plains | I am Joshua Iron Shell from the He Dog community located on the Rosebud Reservation in South Dakota. I have a younger sister and two younger brothers. I take pride in where I come from and who I represent as a young Sicangu Lakota boy. I will be a junior at the Saint Francis Indian School. I participate in basketball, golf, and lacrosse. I am in the Gifted & Talented program and also a member of the National Honor Society. I am very proud to say that I am an active member of the Rosebud Sioux Tribe Sicangu Youth Council and the Tokala Inajinyo Suicide Prevention Mentoring Program. Along with my other youth council members, we have completed numerous community activities, presentations and trainings. My future plans are to continue my path to high school graduation as the valedictorian for the class of 2018, receive an academic scholarship and pursue my degree in Sports Medicine. Midwest | Mary-Shabanaa Bush, 15, proud citizen of the Match-E-Be-Nash-E-Wish Band of Pottowatomi (Gun Lake Tribe) sophomore at Wayland Union High School. President 2016-2017 and Member-at-large 2017-2018 Gun Lake Tribe Youth council, UNITY NUC EC Midwest Representative (2017, 2017-2018). Miss Pottowatomi Nation 2016-2017 and Miss Allegan County’s Outstanding Teen 2017. Mary has served her tribe for three years on the Youth Connection Council as the Youth representative and two years on the Language Advisory Committee; this as given her the opportunity to help youth gain more knowledge about their culture and connect with their tribal leadership. Through her experiences with UNITY and various Leadership opportunities, she has gained valuable knowledge that has strengthened her platform; Pride in Yourself, Pride in Your Culture. Mary uses her platform to promote youth, from all and different cultures, to be proud of their culture. Through one’s Culture you can find confidence and pride in who you are. Mary works with youth from her tribe, as a hoop dance teacher alongside her brother, to keep kids active. Not only does she find peace and strength through her hoop dancing, but also as a baton twirler as she approaches her second year as the featured Twirler for her high school marching band. Mary has competed at state and national twirling competitions and is ranked 4th overall in the state of Michigan. She also stands as a Senior Cheerleader for Hit Force Reign All Star Cheer, and each year Mary attends the World Hoop Dance Competition where she is currently ranked 7th in the world. In the future, she plans to gain more knowledge and run for her Tribal Council and become the Youngest Chairwoman at 18. She also plans to serve her region well and create better communication for the Youth Councils and UNITY. Northwest | I am Scottie Miller, 17 years old and a member of the Swinomish Tribe. I attend La Conner High School and am enrolled in the Running Start program so that I also attend Skagit Valley College. I have been involved in the Swinomish Youth Council since its founding, where am serving my second term as male co-president. I want to serve the people of my region and help interconnect us. I would love to be involved as possible and create a network for the Northwest region. I have served in many leadership roles at La Conner High School, served on different committees at the high school(mainly education), and just began my second term as the Swinomish Youth Council Male Co-President. I am alcohol and drug free and love to set great examples for the youth of my community. At the high school, I am a member of the key club, spanish club, and will be the captain for the 2017/18 basketball season. What I think I can offer for Unity Inc and Native American youth is that I enjoy and am passionate about what I do and I take pride in my work so I can guarantee I will always give my best. For the Northwest I find myself going to many different events so I think it will be easier for me to go and travel to different functions and help connect. I would also love to invite the Northwest to my Youth council’s and tribe’s functions. He’yet nim hoyowus Tashoni Morales. Na’tha Taat’si Yokot inyana. Pacific | Hello my name is Tashoni Morales, I am an enrolled member of the Santa Rosa Rancheria Tachi-Yokut Tribe and a descendent of the Te-Moak Band of Western Shoshone. I am 18 years old and reside on the Santa Rosa Rancheria where I was born and raised. I am a recent graduate of Lemoore High School where I graduated as a CSF (California Scholarship Federation) life member, two-honor cord recipient while maintaining a 4.0 GPA. I will be attending Arizona State University in the Fall of 2017 where I will be majoring in Business Communications and minor in American Indian Studies. I live a drug and alcohol-free lifestyle and believe that the more youth we can get to live a healthy lifestyle the stronger our future generations will be. I love native youth empowerment and look forward to the National Conference every year. If given the opportunity to hold the position of the Pacific Region Representative my goals are to create stronger connections within our California tribes and get more attendees from Hawaii to join our UNITY family! I would like to implement a coalition within the surrounding areas to connect on a greater level, utilize my networking skills and promote supportive programs of UNITY. Western | My name is Joseph Richard Davis, and I am Akimel O’odham. I come from the Gila River Indian Community located in southern Arizona. I am 22 years old and I currently work for Chipotle Mexican Grill. Some of my passions include learning about our culture, youth leadership, spending time with family, and being outdoors. Ultimately, I would love to be able to work in my community in a youth or cultural field. I was first exposed to UNITY at age 17, and just like many others, it changed my life tremendously. Some of my fondest memories are from the past UNITY conferences that I have attended. With that being said, I would love to be able to proudly represent the Western Region and do everything I can to help progress our Native youth as a whole. If selected, my commitment is to work tirelessly to fulfill this role and do my part in making this organization more memorable than it already is for all of the youth that are able to experience it. I want for people to think about UNITY, even years from now and smile ear to ear, just the same way I do every day. Being selected for this role would be such a humbling experience, and I look forward to seeing what the future holds, not only for myself, but for the UNITY Organization. Southwestern |My name is Teran Villa, and I am from Jemez Pueblo New Mexico. I am the son of Nanette Sando and Edward Villa and one of thirteen children. I grew up in my community of Jemez and went to school at the San Diego Riverside Charter School (SDRCS) where many of my family also attended. My hobbies include reading, playing basketball, coaching, and mentoring. Currently, I attend the University of New Mexico where I am double majoring in Economics and Political Science and one day plan to go to law school. My goals are to make a difference in this world through a set of core values I choose to live by which are: respect, accountability, perseverance, and love. I maintain a strong sense of pride in being drug and alcohol-free because of the grip it has had on my village. Only by showing the youth in my community that living a lifestyle without these substances can we move forward and shift the paradigm that has been established for far too long. I am passionate about politics and human rights where I spend most of my time studying and advocating for outside of school. Most recently I was invited to be a part of the SDRCS school board and have started a journey to provide the best education for children in my village. Lastly, I take the wisdom expressed from the elders in my homeland to learn all that I can while in school and return to the place where I was raised. I am proud to be Native American from Jemez Pueblo, where my ancestors have fought long and hard to maintain our traditions and way of life for many millenniums. It is my duty to continue the fight the challenges before us, like that of my ancestors. Southern Plains | Brittany McKane, I am Muscogee (Creek) and Seminole. I am from Little Axe, Oklahoma. I am 21 years old, and I am a student at the University of Oklahoma. My beliefs and actions have their roots in my cultural knowledge and teachings, which I hold sacred. I have a strong will and desire to help create positive change in Indian Country, and I understand that the change we need will begin with our youth. Our youth have knowledge and understanding, now it is time for us to have a voice. Through our relationships to one another, I believe we can affect great change, and lead the rest of the world by example. It is my hope that by connecting with other youth councils, we will then be able to build positive and healthy relationships that will push us forward in making progress for Indian Country. Creating these connections and making new relations is a step forward in the effort to create more united Native nations, that stand together in support and love in times of adversity. I would like to help cultivate this strength for the Southern Plains region, as well as all other Native youth! Northeast | Will Mosley is of the Naticoke Lenni-Lenape Tribal Nation from Bridgeton, NJ. He has previously been a member of the New Dawn Youth Council and Morning Star Leaders Youth Council. Will has also been president of the Native American Awareness club at his High School and has fought to be the first graduate to wear a feather at graduation. He has represented his people from up and down the East Coast to Arizona, to even Ontario, CA. Will has been a strong advocate for prioritizing Culture and Language within his community and other nations. Recently, Will has organized a Lenape youth panel at the Lunaapeew Heritage Days in Moraviantown, Canada. For the past 3 years, Will has been participating in weekly Big House meetings discussing the importance of culture, traditions and the Lenapewosi lifestyle and believes it will help solve many problems within his community and the world. UNITY has helped bring out the best in Will and he hopes to return the favor. Rocky Mountain | My name is Jacob Huggs. I am currently 16 years old and an incoming junior in St Ignatius High school. I have been coming to UNITY now for 3 years and it has been life changing for me personally. Not only me but my friends also. With all the guest speakers and amazing youth who run the conferences and gatherings, it truly has inspired me. I want to be a leader for the native youth on my reservation and even the adults. I am committed to being drug and alcohol free. Also modeling a healthy life style with diet and exercise is a passion of mine. My culture and elders have always been at the center of my life and that has always been my strength. My family has always been there to support me. I see the problems my fellow youth are going through, and it would be a dream of mine to be a voice and help them solve their problems. The language, stories, and history of my people must be passed down and having a voice to echo that vision will only help preserve who we are. I am very excited to see UNITY grow and I hope I can be a part of the process. Southeast | My name is Blake Crook, I am a 19 year old member of the Poarch Band of Creek Indians located in Atmore, Alabama. I am a rising sophomore at Coastal Alabama Community College. I have been very involved within my community where I work as youth counselor for the Poarch Creek Indians Boys and Girls, through this I am able to impact the life of young kids. I have been put in charge of teaching language and culture at the Boys and Girls Club Teen Center. This has allowed me to use my leadership skills in a positive way. Through programs the tribe provides I have been able to participate with youth and teach youth. These programs include the Tribal Youth Council, Pow Wow Club, and Boys and Girls Club. All of which I am a part of and able to put my hand in and help. These experiences have allowed me to grow and become a great role model within my community. Through UNITY I have gained the interest to take part of these things my tribe has to offer.